My.Going121.com is bank of interactive tutorials and associated files, where teachers pursue personal learning paths or access resources as assigned by an online course. Personal paths move through a sequence intended to shape and inform application to the classroom. Teachers document paths and applications through ePortfolio artifacts and blog posts shared with peers and supervisors. There are two strands: the SCL Sequence, walking teachers new to the practice through a series of cooperative and inquiry learning structures, and the SAMR Sets, helping teachers adopt student-centered, 1:1 lessons and create their own materials with Google Apps for Education. Preparing tech-wary and tech-novice teachers who are not comfortable with Student-Centered Learning (SCL) to run 1:1 classrooms requires explicit preparation in both technology and pedagogy. The progression of our SCL Sequence is designed to prepare teachers for SCL one step at a time, in ways that are likely to work the first time. A path through five instructional strategies: open-ended questioning, student-centered discussion, think-pair-share, jigsaw and project-based-learning. A series of eLearning modules and associated resources to help teachers apply SCL strategies for the first time, first F2F and then 1:1 blended. 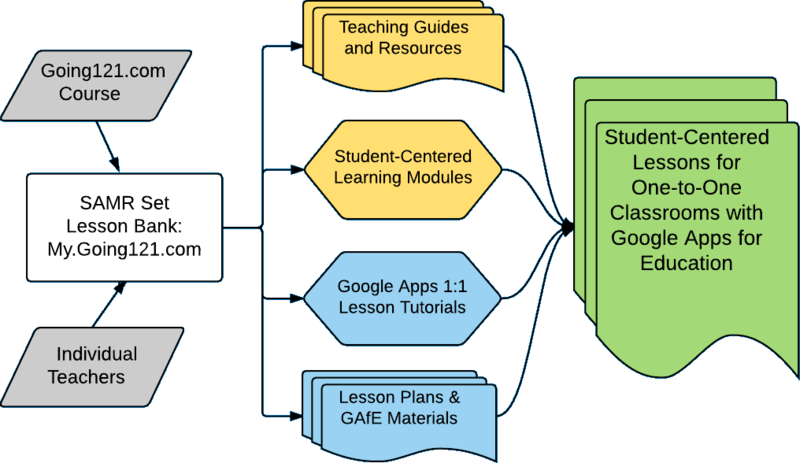 Lesson models for all content areas developed into four versions for application to 1:1 classrooms, each version indexed to the SAMR Ladder for teacher choice. Interactive tutorials that train teachers to run lessons and develop lesson materials with Google tools. Tutorials follow a demo => train => assess sequence. Providing a range of versions give teachers choice in how far to stretch in their integration of technology and their adoption of student-centered 1;1 classrooms. Lesson applications that are not too far from current practice are more likely to succeed. To assist with mastering the technology, interactive tutorials train teachers to develop lesson materials using Docs, Sheets, Forms, Classroom, and other Google tools. Tutorials follow a demo => train => assess sequence, giving teachers numeric results and recommendations.